A lot of effort and time is needed for someone to turn the look of his/her house or office. If you are really patriotic and loyal to Kenya, an acrylic Kenyan map wall clock in your house or office would say a lot. 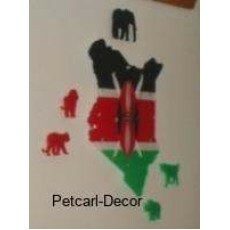 We sell quality acrylic Kenyan map clocks that come with five big animal carvings such as Elephant, Rhino, Lion, Leopard and Buffalo that are stuck beside the main clock. The clock has five colors which resemble the Kenyan flag. If you really need to enhance the look of your house or office with a custom wall clock, you can visit our interior decor shop in Kenya at anytime of the day. The clock has a shield and two crossed spears on a separate plate. We have different superior and classy wall décor clocks for sale. Make an order with us today and be sure of the best wall clock made from a durable material.